I've uncovered two other candidates for the title of Sundal Harum Malam recently: Cananga odorata, and Michelia champaca (or Magnolia champaca). Both trees yield flowers which are highly valued for their scents. Cananga odorata is commonly known as ylang-ylang (ilang-ilang) or kenanga in Indonesia and Malaysia. It is a tropical tree, native to South Asia and Southeast Asia. 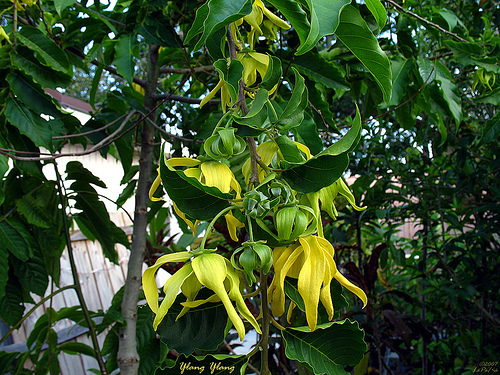 The now famous name ylang-ylang is derived from Tagalog, the national language of the Philippines. According to Wikipedia ylang-ylang does not mean 'flower of flowers'; the name probably came from ilang, which means 'wilderness' or it could be ilang-ilan, meaning 'rare.' In the past, it used to be known as the Macassar oil tree (Makassar is the largest city in Sulawesi, an island of Indonesia). Macassar oil is a combination of fairly cheap coconut oil mixed with essential oils distilled from the ylang-ylang flowers. It was popular during the Victorian and Edwardian era as a hair-dressing aid for both women and men. The flowers are also used as an aphrodisiac and strewn on the bed of newly weds in Indonesia. The ylang-ylang together with the jasmine (sampaguita in the Philippines) are used to decorate bridal beds in many parts of Asia. On course the sweet, pure white jasmine (Jasminum sambac) is the flower of flowers for both bridal and bridal bed decorations and also for garlands and as offering in temples. Its essential oil is also widely used as a top note in perfumes. The essentials oils from the ylang-ylang are used in aromatherapy and are supposed to promote relaxation. However, in high concentration, ylang-ylang can cause headache and nausea. Essential oils extracted through steam distillation of the flowers are widely used as a middle note or 'heart' of perfumes. The fragrance of the ylang-ylang is rich and deep with notes of rubber and custard and bright with hints of jasmine and neroli. A famous example of a perfume with ylang-ylang is Chanel No 5. The fruits of the kenanga/ylang-ylang is also attractive to birds. 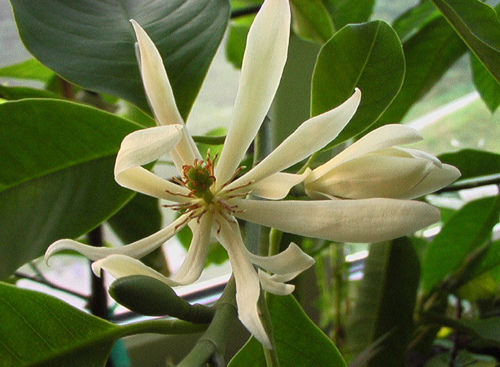 Michelia champaca or Magnolia champaca is a very tall tree native to the Indomalayan region. A member of the Magnolia family, it is known for its strongly scented flowers which varies in colour from creamy white to yellow and orange. However, the tree is valued more for its timber rather than its flowers; it is also used in landscaping as its fruits are attractive to birds. The flower is commonly known as chempaka in Indonesia and Malaysia and as champa in India and Laos. Oddly enough in India, champa refers to both the frangipani as well as the chempaka. The flowers are also used as offerings in temples and floated in bowls of water to perfume rooms. However, the chempaka is not as popular as the jasmine and the ylang-ylang for bridal decoration as its fragrance is considered to be too overpowering. 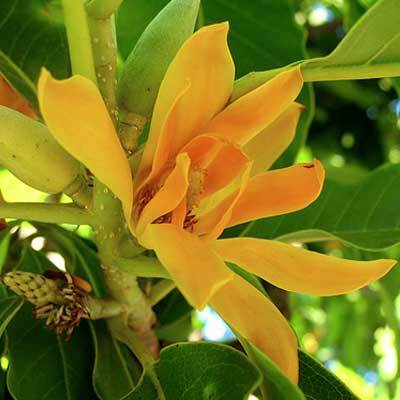 The chempaka is being referred to as the Joy perfume flower on the Internet. This is nonsense, of course. Joy actually refers to the perfume by Jean Patou, first formulated in the 1930's just before the Great Depression. It is nevertheless, considered as one of the greatest fragrances ever created and was voted 'Scent of the Century' in 2000, beating closest rival, Chanel No 5. But my research shows that Joy is actually made from the essences of rose and jasmine, with ylang-ylang and tuberose as the heart, and maybe (just maybe) some chempaka. However, you can get champaca absolute as a single note perfume - Ormonde Jayne launched Champaca in 2002 and Tom Forde created Champaca Absolute in 2009; both are outrageously expansive. White chempaka flower - the Sundal Harum Malam? So apart from the night jessamine, described in the previous post, there are two more contenders for the title of Sundal Harum Malam - the ylang-ylang/kenanga and the chempaka. Although the night jessamine fits the fragrance profile best, the fact that it originated in the Caribbean casts some doubt. A plant has to be growing in this region for hundreds of years to become part of the folklore. 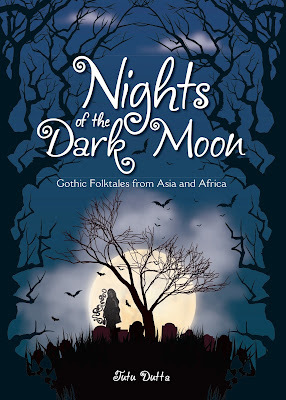 However a blog I recently came across (www.alamendah.wordpress.com ), mentioned that the white chempaka or kantil is said to be the favoured haunt of the kuntilanak (the Indonesian version of the pontianak) in Javanese folklore. So perhaps the chempaka (Michelia champaca) is the Sundal Harum Malam after all - an immensely tall tree with strongly scented white flowers.